there's a lot of truth to that old saying of good things coming to those who wait. 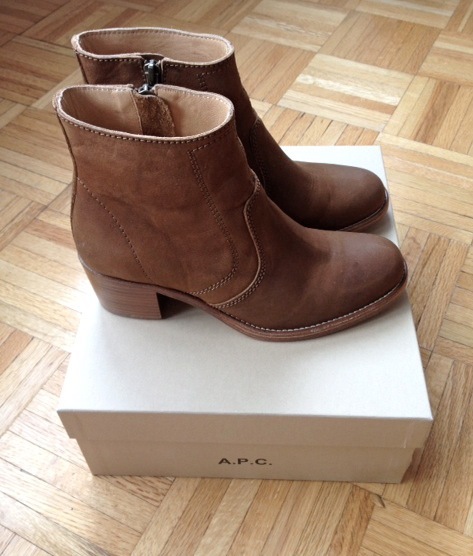 in the interest of having an alternate pair of ankle boots to rotate alongside my beloved Marant dickers, i finally got myself the A.P.C. ankle boots – FYI the color is not as orange-y as it looks in some shops online, rather it's a really nice shade of beigey nougatine. quality-wise, the nubuck calf leather is thick and the stitched leather outsole and stacked-wood heel feel sturdy and well made. the rubber plate on the heel is a nice touch – i always appreciate companies that take that detail into consideration. size-wise, the standard 'next size up if you're a half size' rule holds true here – the 37s are perfect for me with room for thicker socks as well. since i've started blogging, it has become apparent that ankle boots are really the #1 foundation items in my wardrobe. (see also my post on the best of ankle boots priced high and low.) they're flattering, comfy, and stylish, especially for long city walks and trekking up and down subway environs that would otherwise wreak havoc on more delicate footwear. my favorite shoes are always the ones that add a bit of a lift and confidence to my stride – and for everyday, i feel very much myself when wearing ankle boots. as far as splurgey shoes go, these definitely rank up there in the holy grail category! what do you think? do you have a pair? Aaah the APC boots. Those were the ones I coveted but could never quite afford (I spend faster than I save) and I have my Carvela Spoken boots instead. I love this outfit and will probably plagiarise your whole look at some point over the next week as I have dressed like a dogs dinner the last few days. My family don't dress up on Christmas day and I always feel overdressed if I do so now I dress purely to be comfortable when I go and visit. But ... I promise to do better next week. It's been lovely to have made your blogging acquaintance this year too - you're one of my favourite reads. Hope you have a good night on New Years Eve - your outfit looks like what I would love to wear (except I would be too cold) and would inevitably stick on a big cardigan over the top which would kill the whole effect. Ah well. All the best for the rest of the season, Miss Sophie! I, too, have completely switched over to ankle boots-- I've sold all my knee-highs. Congratulations on finding something you love! I think I have found my HG black ankle boots-- the Loeffler Randall Felix bootie. Those and the NOW oxblood booties from No.6 are in heavy rotation. it feels good to get them after waiting so long! you know i'm also a big fan of LR too. Looks nice, sturdy, and polished! I also found myself heavily dependent on the ankle boots this year, last year I was wearing the Golden Goose knee high nonstop, but the ankle boots is much more casual. Not as nice as the Dicker boots but I found Coclico's Seanna boots just perfect with 2inch heels. Just got another one in different color today. thanks nanashi! would love to see yours on your blog soon - happy holidays! they look so good. i'm seriously considering getting one. i bought a pair of these last fall in camel/beige suede, and consider these my holy grail. i at first felt a little guilty for buying at full price, but after a few months of wear realized that it was worth every penny. love yours! Finally, finally -- mine are in the mail! I've been wanting them forever, and succumbed at last when I saw the dark green version for $303 with a promo code at La Garconne. Yours look lovely, and I'm glad to hear it's worth the wait. yay! i think you'll love yours - mine don't seem to need much breaking in either. super comfy right out of the box. I really think these are the best boots ever made - SOO comfortable, and it works better for me than the Marant booties. I am waiting for a black suede one to come back into rotation. agreed on all fronts--I want the black ones to come back too! sweet! love them. my shoe splurge of the year had to be the cobra rock south highland boots from arrow +arrow. an awesome take on the desert boot with a square toe and lots of vintage appeal. happy new year to you! OH! Those shoes are beautiful! It's unfortunate they didn't come in my size, but they are gorgeous. These are fabulous—congratulations on your find. I passed the APC store in NoHo just a few days ago while they were having a sale and thought of you. I agree about the marvelous practicality of ankle boots for city and subway life—most of the days in NYC have seen me wear mine, and it's always perfect. thanks Catherine! happy holidays to you by the way! Oh man. Found these left just in my size on sale at SSENSE. It was a sign. Hope they work as well for me as they do for you! Those boots are pure perfection! These are great and look wonderful on you! I've a couple of pieces by APC and would love more. I've always adored ankle boots and they get the most wear in the UK climate. Agree, these look pretty much perfect, simple, well made, angle/height of the heel look right and the ankle opening's not too big. Not to mention the colour, caramel/tan is the hardest to find! Yep, I am so very tempted to get these now rather than wait for the sales :-) There's free shipping on their Fr site. They look great! I fell in love with them in Paris but still haven't invested! One more voice to the praise! The boots look great on you! Nice purchase indeed! oooh, i love these! definitely worth the splurge, they're such a classic piece. i've always had trouble with apc sizing (usually a 39.5, but 40s are much too big), but i would love to find a similar pair someday that works for my silly feet. thanks Erica - the 37s are just roomy enough in the toebox for me and perfect with mid to thicker socks. i wonder if the 39s in this style may work for you if APC has adjusted their sizing now? I'm in the market for a pair. But they have to be comfortable enough for a 3o minute city walk. Any recommendations? Love the look of the Dickers and the APCs, may have to go with something like this instead. You look chic in those boots! I was contemplating between the IM dickers and the A.P.C. boots but later came across a taupe pair from Mango Touch. I have never bought anything from Mango but I have to say that those boots are really sturdy and comfortable with a 2 inch height. I wore it the entire day while out shopping and it was perfectly comfortable! Agreed! I feel my best and most comfortable in ankle boots. They also go great with everything. I definitely have a few pair in my closet. Isn't that the best thing when you wait patiently for the perfect item? Congrats! I have been searching for the perfect pair of neutral boots all fall and winter and you inspired me - I bought a pair of these today and I am in love! Thank you!!! They were a splurge, but I haven't taken them off all night and I have no regrets!!! I was wondering if you have your apc boots vibrammed? Thanks!